Pushing the limits of the largest single-aperture millimeter telescope in the world, and coupling it with gravitational lensing, University of Massachusetts Amherst astronomer Alexandra Pope and colleagues report that they have detected a surprising rate of star formation, four times higher than previously detected, in a dust-obscured galaxy behind a Frontier Fields cluster. She adds, “Historians want to know how civilizations were built up, and we astronomers want to know where and how the elements in the universe were formed and where everything is made of, came from.” The study is accepted for publication in The Astrophysical Journal. The new tool that has made such revelations possible is the 50-meter Large Millimeter Telescope (LMT) which has been observing as a 32-meter telescope located on an extinct volcano in central Mexico in “early science mode” since 2013. Operated jointly by UMass Amherst and Mexico’s Instituto Nacional de Astrofísica, Óptica y Electrónica (INAOE), it offers astonishing new power to peer into dusty galaxies, the astrophysicist says. As early as next year, Pope and her colleague Grant Wilson will install on the LMT a new state-of-the-art imaging system he is building, dubbed TolTEC. It will offer mapping speed 100 times faster than the LMT’s current capability making it the fastest millimeter-wavelength polarimetric camera on Earth for conducting deep surveys of the universe, Wilson says. It should allow astronomers to create a census of star-forming galaxies, and observations that require five years to complete today will be done in a little over one week. Pope says, “Currently, our census of dust-obscured star formation activity in galaxies is severely incomplete, especially in the distant universe. With TolTEC on the LMT, we will be able to make a complete census of dust-obscured star formation activity in galaxies over 13 billion years of cosmic time. This work was supported by CONACYT, the Mexican science and technology funding agency, the U.S. National Science Foundation, INAOE and UMass Amherst. 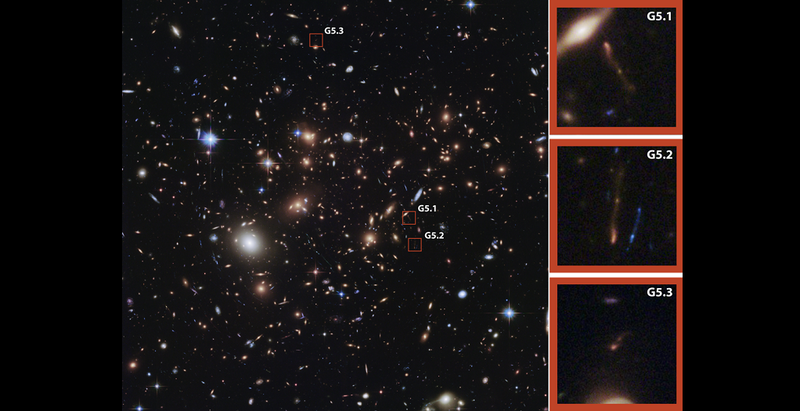 Gravitational lens support came from NASA’s Jet Propulsion Laboratory, Hubble Space Telescope Frontier Fields program and the Association of Universities for Research in Astronomy.